Need to Vent! 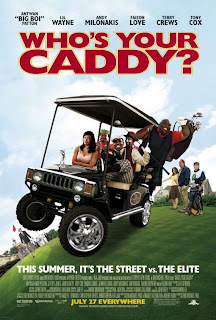 — Movie Reviews with a Twist: WHO'S YOUR CADDY? There are few occasions when a writer or a producer can go to a studio executive with a proposed movie title that is so intriguing or so marketable that it will virtually guarantee an immediate production commitment. Last night while channel surfing I ran across an ad for a film to be released shortly that clearly has the best "high concept" title thus far in 2007. This title is nothing short of brilliant. Hats off to Writer/Director Don Michael Paul for coming up with the Hollywood equivalent of a Hole In One. Of course, a great title doesn't always equate to a great film. Should WHO'S YOUR CADDY turn out to be be more like a Double Bogey (and we're not talking about Humphrey here), then expect Needtovent.com's intrepid reviewer to gleefully tee off shortly after the nationwide opening on Friday, July 27. If only this had been filmed in 3-D!